Arthur Fred Loftin was the sixth child born to Other Frederick "Fred" Loftin and Nannie Elizabeth Lowrance. 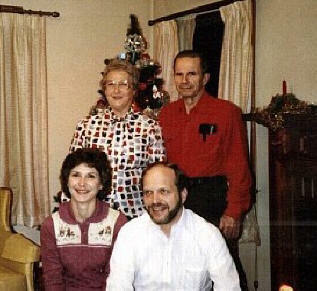 Arthur Fred was born 21 Jan 1923 in Catawba, Catawba County, NC. There seems to be some discrepancy concerning Other Frederick Loftin's first name. On his headstone at Center Methodist Church in Catawba, NC, his name is listed as Otho Frederick Loftin, but his Death Certificate, the Catawba County Vital Statistics Record for Deaths, and his WW1 Draft Registration card all list his name as Other Frederick Loftin. There is a "possibility" that "Other" was an incorrect spelling for the name "Arthur", which makes sense in the face that he named his son Arthur Fred/Frederick Loftin. The 1930 Census shows Other Frederick and Nannie Elizabeth Loftin living in the Caldwell Township of Catawba County. Arthur Fred's age was 7 years & 8 months, and his siblings Gladys, Olive, L.D., and Lola May were also living in the family home. 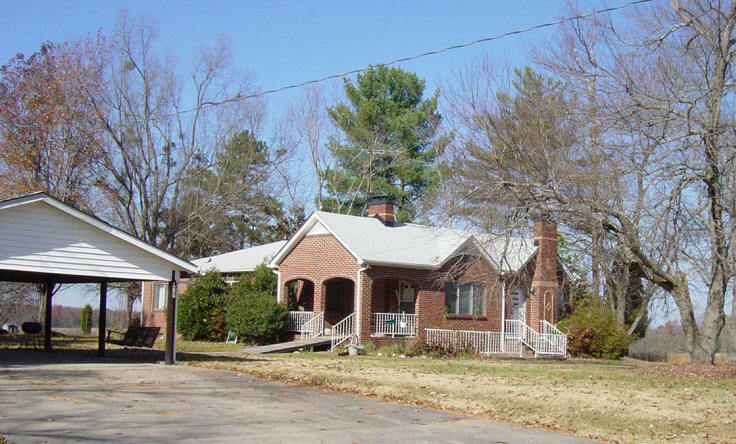 Arthur Fred's paternal grandfather, Washington LaFayette "Fate" Loftin, was living nearby. His grandmother Margaret Jane Lackey Loftin had die on 27 Mar 1928 and his grandfather (Fate) married Charlotte Caroline Drum. 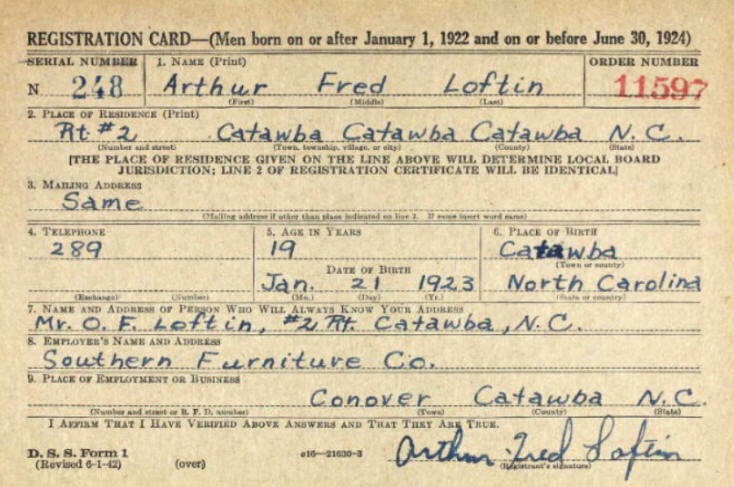 Arthur Fred's WWII Draft Registration Card shows his age as 19 and that he was employed by Southern Furniture Company in Conover, NC. 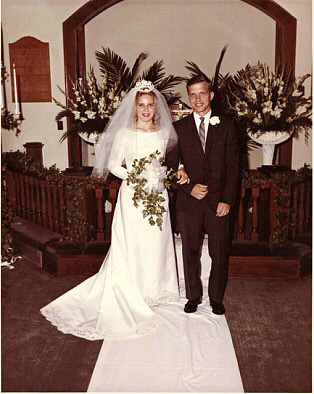 Arthur Fred married Rachel Janice Hildebran, the daughter of the late Robert "McKinley" Hildebran and Loretta Brown Hildebran. She was born 13 Nov 1924. Their marriage produced two children. 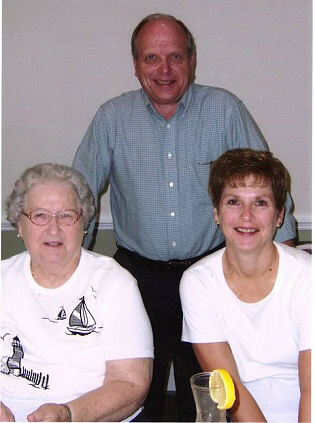 Janice worked at Southern Furniture and Carolina Glove. 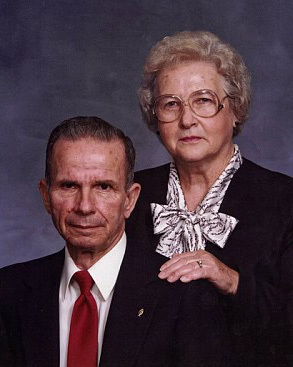 Arthur Fred Loftin died 29 Aug 1999 in Catawba, Catawba County, NC. Janice Hildebran Loftin, 80, of Buffalo Shoals Road, Catawba passed away Sunday 21 Aug 2005 at Catawba Valley Medical Center in Hickory. She was the daughter of the late Robert "McKinley" Hildebran and Loretta Brown Hildebran. She was a member of Center United Methodist Church in Catawba and formerly worked at Carolina Glove and Southern Furniture. In addition to her parents, she was preceded in death by her husband, Arthur Fred Loftin; a brother, Robert Hildebran; and two sisters, Annie Mae Huffman and Elsie Hildebran. 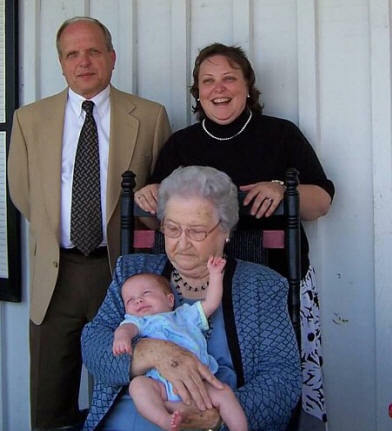 She is survived by a son, Alfred Loftin and his wife, Martha, of Wake Forest; a daughter, Patsy Harwell and her husband, Larry, of Catawba; two granddaughters, Heather Holding and her husband, James, and Kara Loftin, all of Wake Forest; a great-granddaughter, Lauren Holding of Wake Forest; and a sister, Carmen Harris of Maiden. The Rev. Paula Northrup officiating. The body will be placed in the church 30 minutes prior to the service. Burial will follow in the church cemetery. Thanks to Heather Loftin Holding at heatherjlh@gmail.com for sharing information and photos about her father, Alfred, and grandgather, Arthur Fred.